On the other hand, hiding the suspicious code from the victim is a prerogative for an attack with higher chances to succeed. Some techniques are needed to avoid been spotted, from victim to developer or admin investigation. The slice(1) function returns the location.hash string from the character at position 1 (# is the 0), which is evaluated by eval() function. Although all the code after # will never be sent to server, thus avoiding any logging, it’s clear that too much suspicious activity is being done here and an user may spot this. But the worst part is that will not work, at least in Firefox, because the single quotes will be turned into %27 and eval() function will complain about it. We would need to add the decodeURI() function over the location.hash.slice(1), which could make our input larger and with the same user problem above. 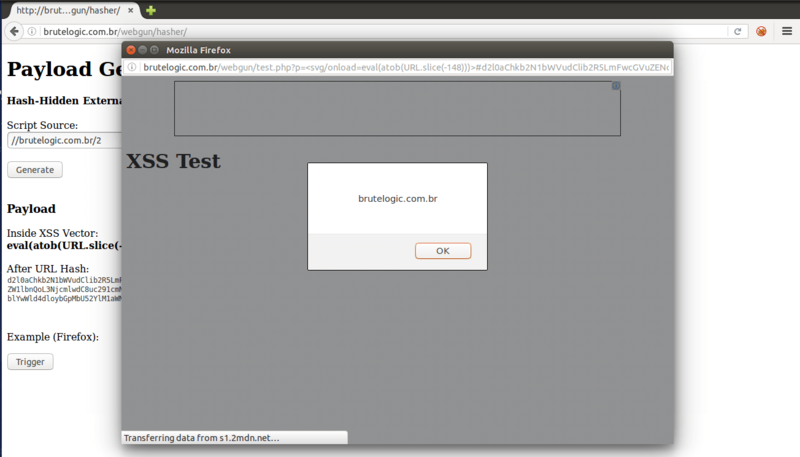 Using “//brutelogic.com.br/2” as the script, which just pops the document domain in an alert box, we get rid of the quotes with the “.source” regex trick in the createElement() function and with the atob() function to encode our source in base64 for the “src” value (along with the same “.source” trick). It’s boring to double encode and calculate the length of the final base64 string, so I made a simple payload generator here. Even with our efforts, script code can still be discovered. To hide it, in server side, it’s possible to use obfuscators like this one. But it can be reversed, so if we really want to not let anyone know what’s happened to the victim it’s better to self delete the file from server after the targeted attack. Proof of Concept (PoC) code is here and it works similarly to this: rename it to index.php and put it in a web server folder. But be sure to have it writable by the web server user and save a copy for replacement after deleting. This is the first time I actually come across an article about covering your tracks after XSS exploitation. All the articles I have seen before only focus on the attack phase. This is very interesting and actually useful not only for an attacker but also for a penetration tester. I’ll surely check your website again for new articles. Thank you very much, Fabio! Never thought about self erasing part. Nice.